The second part of the design process started with a new research stage and many new sketches on animals and forms, which could be combined with the previously designed creature. 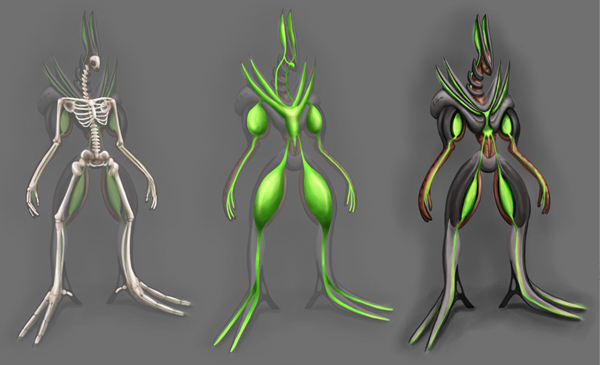 I then did some sketches on the topic of anatomy and invented a short story to give the glowing green elements on the creature some kind of fictional background support. The filled Character Sheet, I’ve taken from the book “Creative Character Design” by Bryan Tillman, helped a lot to get to know the character itself and thereby be able to design it with more details fitting into its fictional surrounding and storyline. 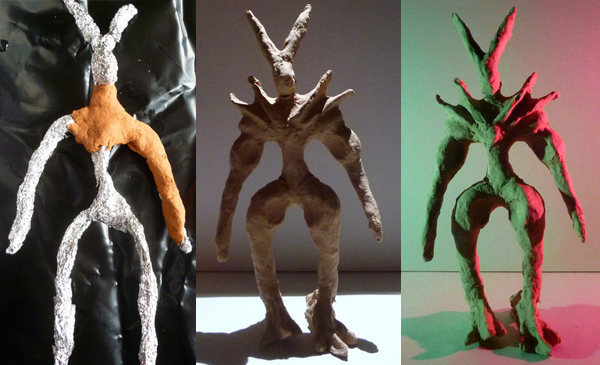 To get to know the forms and volumes of the creature, I’ve decided to give the real clay modeling a try. It was my first attempt to work with this material and it was interesting to realize how it could help to think about the forms and elements from a different perspective. Later I also did some lighting tests with the rough modeled figure, to try out different light moods and settings for the final illustration. 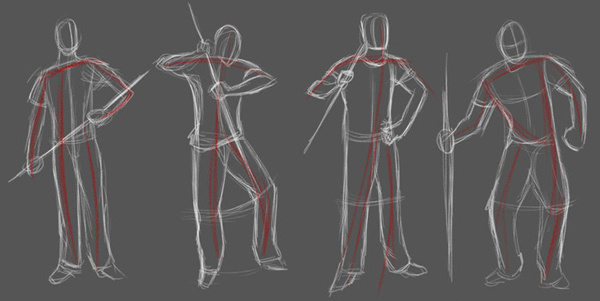 For the final positioning of the creature I did some gesture / position drawings of different models to find a convincing one, some kind of hero pose to present the creature as a strong representative. To find a good combination of enemy, surrounding, figure and light sources I also did some colored position sketches in a silhouette style. This helped a lot to balance the final picture, although, looking back, I think I should have taken a different idea. For the final design presentation I did a rough analog sketch to sum up the final ideas and decisions, followed by a final color sketch to decide about the color scheme of the picture. The next step was a grayscale image with its defined values which was later the base for the detailed realization of the final pic. 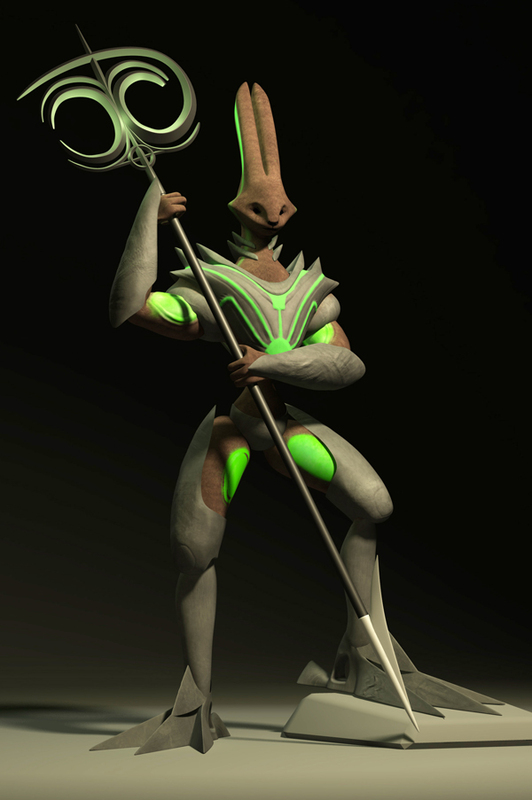 After the Creature Design was finalized the final three dimensional modeling was done by Alexander Holz. For my design part I sum up that the picture itself is too complex. 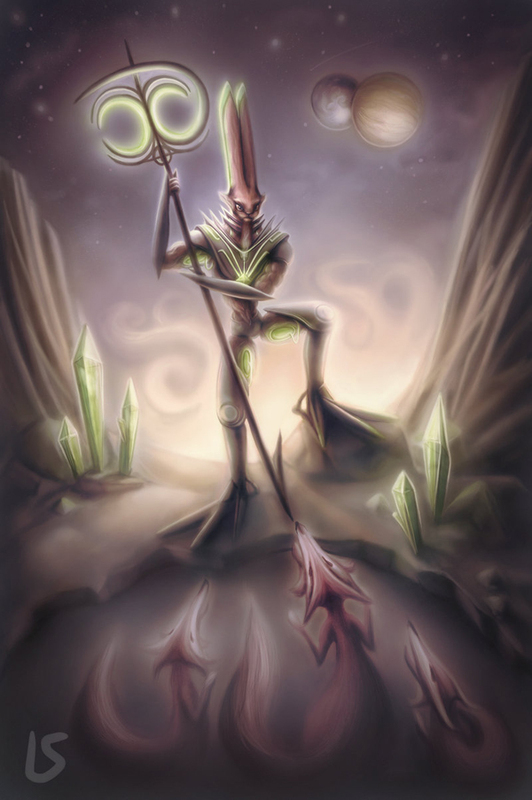 The designed character in fact stands in the middle of the picture but the composition itself seems not interesting enough to really support the characters presentation.